PacktPub awards Open Source CMS Awards every year. 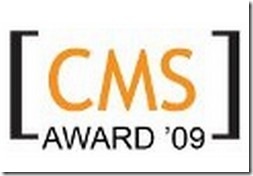 To my delight, WordPress has won the Overall Best Open Source CMS Award for the 2009 Open Source CMS Awards. In the last 4 years, this is the first time WordPress has won this award. 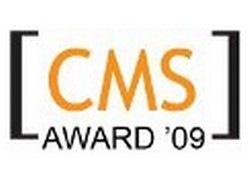 Plus, it was named first runner-up in the Best Open Source PHP CMS category inching ahead of Joomla. And Drupal outranked it only by a small margin. For those unaware, WordPress is an open source blogging platform that powers hundreds of thousands (if not millions) of websites including this one. To even those who are familiar with WordPress, it is commonly known as a blogging platform. But, a little known fact is that WordPress can also be an excellent Content Management System. WordPress has already gained a lot of momentum and exposure over the last few years and this award is going to give it a further push into being recognized as a CMS platform as well. My wife recently launched her WordPress based web development business – KarShan Media (shameless plug) and she has been building websites with WordPress as a CMS for a long time. This award is going to make her life a tad bit easier convincing interested individuals that WordPress CAN power their website. You can check out all the PacktPub awards for 2009 here. .-= Ali´s last blog ..Women in Turkey =-.